I've talk about winter on this blog before, or more specially, your hair care routine in winter. But when I looked down at my hands this morning, in the 46º weather mind you, and silently screamed at what I saw. Okay, maybe it wasn't so silent. The cold weather was reeking havoc on my skin. My poor hands were dry and cold and lonely. So after I rubbed them together, let them be friends for a bit, I decided I needed to take better care of my skin in this dry winter weather. And since I assume that all you lovely readers have the same problems I do, obviously I'm going to share some tips. Try a hand or body scrub. Scrubs are super fantastic. I used one while I was on vacation on my hands, and they felt super soft for days after. Not only will a scrub exfoliate your skin, but it will also leave you feeling silky smooth after it's rinsed off. Moisturizer. Obviously. Find yourself a really good one. 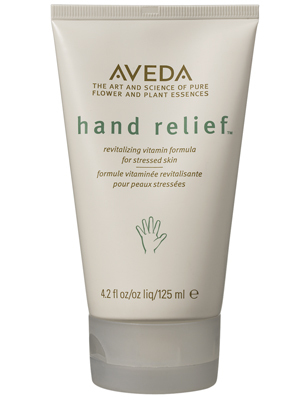 I love Aveda's Hand Relief. It penetrates deep down and really leaves your skin moisturized. Put one everywhere. In your purse. At your desk. By your bed. I promise, your hands will thank you later.